In case you have not heard, which you probably have not because no one reads this blog anyway, but I am a big fan of the Bronx Bombers and they are pretty good. The Yankees played the Blue Jays this week and like always they won the series and the Blue Jays are dead. The Bombers led by future MVP Aaron Judge are among the best teams in the MLB. I did not expect Aaron Judge to have this good of a season this year, in fact in my season preview for the Yankees this season, I said that Aaron Judge would be great if he hit 25 home runs. He currently has 13 home runs through 26 games of the Yankee season, I was clearly wrong on what I thought Judge would do this season. Judge was named the AL Rookie of the Month for April and he has followed that up with having a great season. His plate discipline has improved immensely since last season and he looks like he could be a future superstar of the Bombers. He has been a great reason why the team is in first place on May 3rd and does not look like it is going to anywhere but up from here. The offense has been great this season led by Judge and Starlin Castro. Castro is having the best season of his career and will look to get to impress fans of his former team this weekend. Castro’s home run to tie the game against the Orioles on Friday night has propelled them to having a great run this week. Castro has exceeded the Yankees’ expectations this season and could be in the Bronx for many years to come if he continues his great run for the next five months. The Yankees have received have timely contributions from the veterans on the team, Holliday and Gardner. 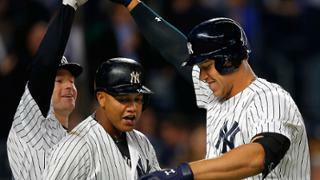 Gardner single handedly beat the Blue Jays on Tuesday, which stopped the Yankees’ brief two game losing streak. Gardner who started out slow has turned into a great table setter for the middle of the Yankees’ batting order in the last week. Holliday, who is part of the middle order benefiting from Gardner, had a big home run last night. Holliday’s three run home run last night brought back the Yankees right after they had fallen behind 4-0 in the first inning. With the young players overachieving and timely contributions from veterans, the offense will continue to be great. The biggest question mark for the Yankees coming in to the season was their starting pitching and it still is their biggest question. CC Sabathia who had a few good starts at the beginning of the season, has cooled off and struggled in his last few starts. CC, the veteran that he is, has been able to limit the damage and eat up innings while the offense can get them back into the team. The others in the rotations have been having average seasons, just good enough to be carried by the offense. The rotation will remain a question mark but hopefully they can do enough to be carried by the great bullpen and the offense. Look Ahead- The Yankees have a short five game interleague road trip this week. They take on the World Champion Cubs this weekend, more on them coming tomorrow morning, and then they had to Cincinnati before they head back to the Bronx. The Yankees need to continue this good run and this season could end special.